We’ve told you about Acne Barbie. We’ve welcomed you to Normal Ken. And now it is our pleasure to introduce you to the latest doll breaking down stereotypical barriers – Hijarbie. Come and meet Instagram’s newest fashion icon and the first Muslim fashion doll. In a world where toys often simulate reality, it seems unnatural that our children are only seeing one side of society. This is exactly why 24-year-old Haneefah Adam of Nigeria designed a doll that resembled what she (and millions of others) see as ‘normal’ – a doll who wears modest clothing that covers her body and a hijab that covers her hair. Like many of us, Hijarbie loves fashion, loves spending time with her friends and loves posing for photos on social media. 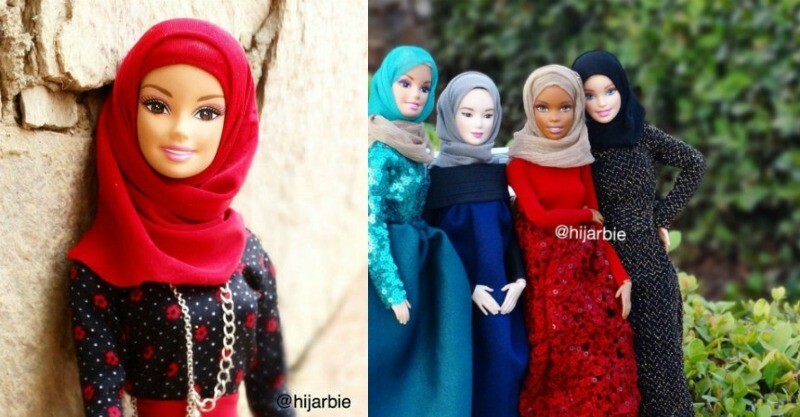 However, Hijarbie isn’t just an Instagram account designed for a doll. She is a symbol of acceptance and hard work put forth by one very talented young woman. In past interviews, Haneefah explains that the reason she started Hijarbie’s Instagram account is to show young girls that there is an alternative to the traditional Barbies out there. #Squad #🌸 #🌻 #🌺 #hijarbiestyle Tag your squad. The Hijarbie clan, complete with women of different skin tones, are elegant, beautiful and a wonderful addition to any child’s toy box or adult doll collection. And Hijarbie is proving to be quite the fashion icon and social media superstar. She has over 70,000 followers on Instagram and stays on trend with the latest fashions and news, even emulating recent Olympians in her designer duds. Dedicated to the women inspiring Muslim girls all over the world at the #Olympics! !❤️ Do you recognise them? Haneefah designs all the outfits herself and finds her inspiration from popular Muslim fashion bloggers. It is through her inspirational dolls and her many fashionable outfits that Haneefah hopes to help Muslim children develop a sense of identity and value. While our world has not quite embraced the cultural differences and the right for people to wear whatever they want (on the bus, on the beach or anyway else), it is refreshing to see Hijarbie gaining in popularity. She is now available for sale at Ibraheem Toy House, an online toy store based in the UK. This isn’t the first time someone has dared to step outside the plastic mould and design a doll that dares to defy the stereotype. Check out Lamilly’s collection of ‘average’ dolls including their doll that comes complete with a monthly period and their latest Ken doll who “may not have a six pack, but he does have a fantastic sense of humour”.